Electric home refrigerators didn’t begin to replace home ice boxes until the 1920s and to keep things in those ice boxes cold, one needed ice. Here in the northeast, much of that ice was cut from ponds that froze over in the winter. The ice was cut and then stacked in ice houses to be used throughout the year. During summer of 2015 one of the exhibits at the Woods Hole Historical Museum told the story of the ice and the ice houses that were found around the shores of many of the ponds in Falmouth. Much of what was on display in that exhibit is now online and can be viewed by clicking here. This online exhibit is devoted to Women of Woods Hole over age 75. Joan Pearlman and Sally Casper photographed approximately 115 women and the photographs are paired with short autobiographical sketches. Some of the women are summer residents and visitors, others are year-rounders. Some are scientists, others are artists. Some are associated with MBL, others with WHOI. Most have been parents and home-makers. All love Woods Hole. To see these wonderful photos and read the stories of these remarkable women, click here. 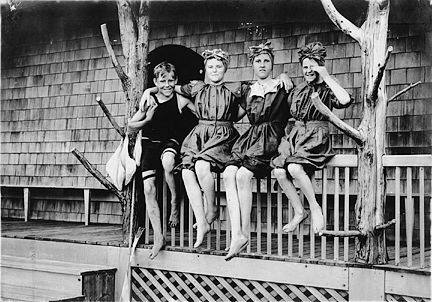 The Museum has a collection containing over 5,000 photos of Woods Hole and Quissett going back to the 1850’s, including family albums and photos, village scenes, boats, yachts, steamships, pictures of the early days of the scientific community starting in the 1880’s with the U.S. Fish Commission and the Marine Biological Laboratory, as well as albums showing MBL activities in the 1920’s and 1930’s. You can view thumbnails of many of the photos that are available in the Museum Archive here. In the early years of the 20th Century, Michael Walsh became famous growing rambler roses on the Joseph Fay estate in Woods Hole. You can learn more about Walsh, the Fays, and the world-famous roses in our online exhibit by clicking here.